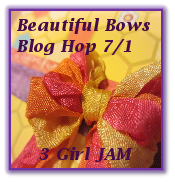 **Oma's Crafts**: 3 Girl JAM "Craft Queen"
Pretty card Gloria!! Happy Friday! Wow, so vibrant and fun! Love the sterling ribbon against all the color...really emphasizes it!